We are pleased to have Fran Forman as our contributor. As a kid, I always thought of myself as “an artist” but only because I could draw reasonably well, and I was totally hopeless in anything else. My doodles filled the margins of my schoolbooks, leaving little room for the text. I assumed I would major in art when I went to college, but instead, I was drawn into the world of politics and sociology. I was fascinated by the questions – why people live the way they do, why they make certain choices, how they’re effected by, and effect, their culture – and I sought to understand myself as well as to forge my own identity. Art took a back seat. (It’s also possible that I was intimidated by the really accomplished artists at school; my insecurity was all too apparent.) Moreover, I got caught up in the whirlwind of the sixties, and becoming a foot soldier in the “cultural revolution” seemed more important than making pictures. After college and a few dead-end jobs, I entered a school of psychiatric social work, and after receiving my Masters, worked in a drug treatment program for several years. It was during that time that I realized I was much more interested in drawing and designing my office space, imagining colors and picking out posters, than I was in listening to my clients. Making the decision to abandon my career (and a hard-won post-Masters degree) and move into ‘art’, whatever that meant, was daunting and exhilarating. I immersed myself in the world of photography once I realized that images could tell a story and create an emotional response while adhering to certain aesthetic principles. Over a period of a year or two, I developed a portfolio adequate enough to gain acceptance into an MFA program. I had decided to study photography and graphic design…photography because I loved it and graphic design because I needed to make a living. Graphic design is at the intersection of fine art and commerce. For years I worked full-time or free-lanced as a designer, and I came to love fonts and typography, architecture and signage, branding, print, and even the smell of offset inks. Photographs were simply used for visualizing and ‘comping’ (for example, pasting a colored paper scaled-down version of a proposed new sign on a building). For fun, I created collages out of cut-up magazines and old family photos. But when I was introduced to Photoshop in 1992, my life took another dramatic turn. I became hooked on a new form of image-making and manipulating photographs after processing, and my love of drawing and photography found a home in my new digital tool set. I was lucky to find work in what was then referred to as “new media” and continued to integrate my love of drawing with my photographs. One of my first jobs was the design of all the art and graphics for a visually rich encyclopedic exploration of a book by, and life of, Jack Kerouac and the Beats. 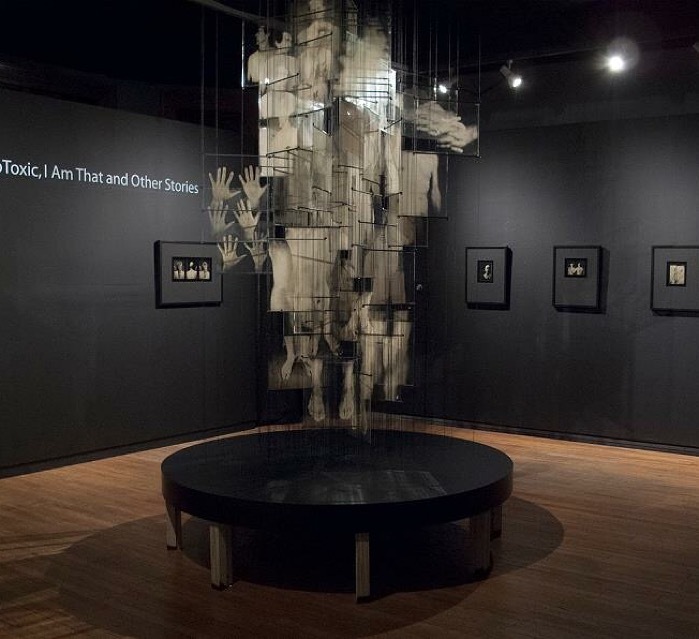 Ancillary sections included a chronology, timeline, animating relationships, galleries of art and photography, and an audio and video sampler. I illustrated the book’s chapters and hundreds of screens. As this was in the early 90s, all this content had to fit onto one little CD-rom. Now, of course, we chuckle at the limitations imposed by this archaic technology, but one learns to be creative even with limited tools. (Sadly, Penguin Books abandon its interest in producing electronic books – for about a decade). For this project and others, I used archival images, combining them with my own photographs. I never bought stock photos (our budgets were limited anyway). I continue to design photo composites of my own family, and now my friends happily share their photos of ancestors long forgotten. To learn more about the work of Fran Forman please visit her page at Fran Forman. thank you I enjoyed reading very much. Fascinating images. oh Fran, always fascinating – I can see and feel the intersection of your many lives!